We’re also going to touch on three important factors to consider when choosing keywords. These are relevance, traffic and competition. In search engine marketing ( SEM ), you pay every time someone clicks on your ad. So naturally you want to make sure you’re getting your money’s worth. Let’s go back to our wedding photographer in Lagos, and we’re going to imagine you’re the business owner. You’ve just updated your website, and now you want to attract new visitors. 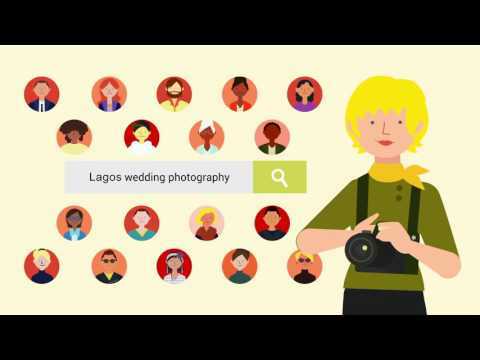 You find that on average, the keyword wedding photographer Lagos costs you about $2 per click. By the way, a “keyword” doesn’t have to be just one word - it can be a phrase as well. Now, without knowing more about what these clicks are worth to your business, you can’t really know whether this is a good keyword or not. For example, if you discover that the average value of these clicks to your business is $40, it’s safe to say that this is a good keyword. On the other hand, if the average value is $1, then you might want to make some adjustments. Measuring the value of your ad clicks will help you know if keywords are “good” or not. But before you start a campaign, you won’t be able to measure the value your keywords are generating. So how can you research keywords before adding them to your campaign? Well, you have a few different options here. The first thing to ask yourself is: is this keyword relevant? Or in other words, does this keyword closely describe your products or services? Keywords that indicate a person looking to hire a wedding photographer in Lagos are clearly relevant. However, keywords that suggest a person looking to do their own wedding photography, or that suggest digital photography when you only shoot in film, are far less relevant. Try to focus solely on keywords that are relevant to your business, and you’ll have more success going forward. Another factor to consider is how much traffic a given keyword is likely to get. In other words, you might compile a list of highly relevant keywords... but what if nobody searches for them? In this case, we have to go back to the drawing board. This might describe your business exactly... but with so much specific detail it’s unlikely that many people will search for it. Bidding on this keyword probably won’t result in many people finding your business. is still relevant to your business, and may result in more exposure. Keyword research tools can provide traffic estimates to help you get a handle on this. But in reality, you’ll probably have to use a bit of trial and error to figure out which keywords are relevant and get sufficient traffic. Now you know how important relevance and traffic are to finding good keywords, let’s move on to one more important factor to consider when determining if your keywords are good. Quite simply, you’re going to want to consider what your competition are up to. Think about it: if a keyword is relevant, and gets quite a bit of traffic, your competitors are more likely to be using it too. For instance, when it comes to the keyword Lagos wedding photography, there’s a good chance that every photographer in Lagos is bidding on that keyword. That doesn’t mean that you shouldn’t include it. But you should look for keywords where the relevance and traffic is high, and competition relatively low. Perhaps a keyword like Lagos film wedding photography would be less competitive, because it’s more unique to your business. So, when you’re thinking about which keywords you want to include in your ad campaigns you’re going to want to remember relevance, traffic potential and competition. It’s a bit of a balancing act, but weighing these three factors can set your ad campaign off to the right start. Be sure to monitor your keywords closely - if you do, you’ll quickly learn about what’s working, and then you can make adjustments as you forward.